Facebook remains the primary platform for most Americans. Roughly two-thirds of U.S. adults (68%) now report that they are Facebook users, and roughly three-quarters of those users access Facebook on a daily basis. With the exception of those 65 and older, a majority of Americans across a wide range of demographic groups now use Facebook. 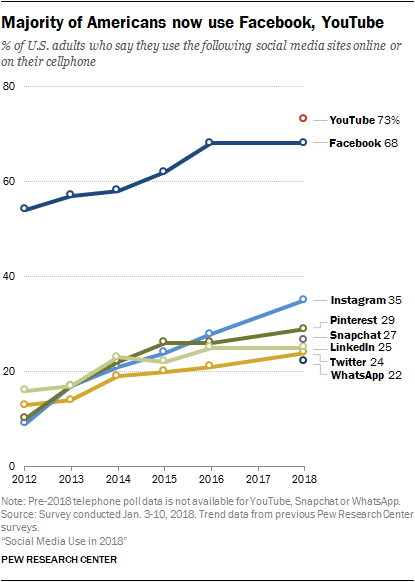 The video-sharing site YouTube – which contains many social elements, even if it is not a traditional social media platform – is now used by nearly three-quarters of U.S. adults and 94% of 18- to 24-year-olds. And the typical (median) American reports that they use three of the eight major platforms that the Center measured in this survey. 88% of 18- to 29-year-olds indicate that they use any form of social media. That share falls to 78% among those ages 30 to 49, to 64% among those ages 50 to 64 and to 37% among Americans 65 and older. Americans ages 18 to 24 are substantially more likely to use platforms such as Snapchat, Instagram and Twitter even when compared with those in their mid- to late-20s. These differences are especially notable when it comes to Snapchat: 78% of 18- to 24-year-olds are Snapchat users, but that share falls to 54% among those ages 25 to 29.